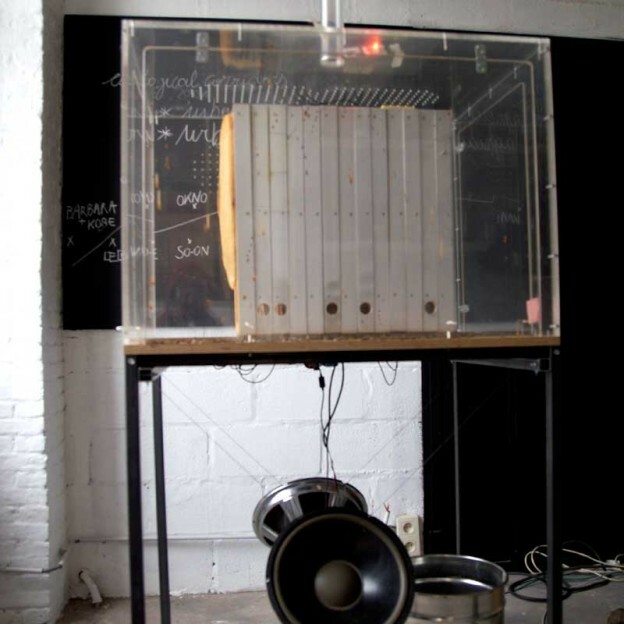 Time Inventors’ Kabinet [TIK] is a collaborative experiment with time. For the last two years, a series of artists and thinkers have made an attempt to devise the future of an alternative and ecological time. This transdisciplinary project focuses on non-linearity and parallelism. All kinds of environmental information; be it a city, a field or beehive, can be transformed into sound and vision. Wind time maintains a distributed network that connects gardens in rural areas and cities, bringing them together in non-conventional relational databases, forming one long open green that has its own notion of time. The TIK festival has rounded up the participants of this 2-year international media art project. Come and visit the Kabinet of ecological wonders! From 10 to 12 may 2012. All around the OKNO, Imal and Qo2 spaces and on the rooftop garden you’ll discover fresh air labs & methods for growing experimental media art. The Bee Monitoring installation probes deeply within a beehive at Okno’s garden. Between may 2011 and april 2012, a complete cycle, from the awakening till the hibernation of the bee population, was recorded in a continuous stream of pictures, sound and sensor data. All this information is readily available for beekeepers, scientists and other artists, offering an opportunity to study the bees as bio-indicators. The installation is an artistic evocation of this, and invites for further sonification and visualisation.